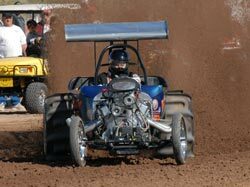 Thunder Valley Sand Drags released their 2009 race schedule today. 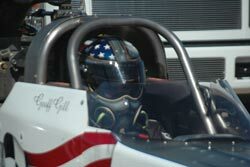 For more info on TVSD, go to www.thundervalleysanddrags.com. Click “Read More” to read their 2009 race schedule flyer. 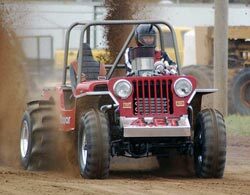 Atoka Motorsports Park kicked off their 2009 season on March 21. 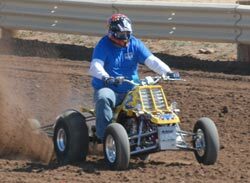 The first race of the season showed what a family sport sand drag racing is. Father and daughter Darwin Beck (Pro 1) and Kristy Chavers (Pro 2) both made it to final rounds. Father and son Jeff Walton (Pro 3 Quads) and Trey Walton (Pro 4 Quads) were both finalists. Mother and son, Anita Zurline and Phillip Stephens made it to the Pro 3 Quads Money class final rounds with Phillip taking the win. Rounding the family affair out, another father son tandem Howard Ford (Pro 2 Car) and Cody Ford (Pro 4 Quads) were also finalists. This is not even all of the family combinations racing at the track. Tim Feuerhelm, of Atoka, took home the Pro 1 Cars Money Class win. Results and story courtesy Derek Howard. Photos courtesy Lone Star Graphics -- www.lonestargraphics.info . The second race of the NSDA season was a wild one with great competition and quite a few surprises ending up with the winner’s trophy at the end of the day. Let’s take a look back through photos at this event with images from our friends at C3 Productions, www.c3productions.net and http://www.myspace.com/c3productionsphotos. 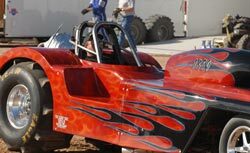 The 2009 NSDA series completed its second race of the season in Yuma, AZ with some awesome racing on eliminations day. A first time Top Fuel winner emerged with Shane Switzer taking the win over first time TF finalist Matt Ludlow. Nick Januik won his first NSDA Top Alcohol class title over 2008 class champion Mike DeNunzio. Billy Morris scored his second NSDA Top Eliminator class victory defeating Larry Snow in the final round. Pro Bracket class winners on the day were Mike Erwin (Pro 1), Steve Anthony (Pro 2), Charlie Johnson (Pro 3), Brooks Ryan (Motorcycle Pro 1), and Joey Weaver (Motorcycle Pro 2). In the coming months, NSDN is going to feature some of the baddest race cars tearing up the sand drag tracks across the country. This month’s race car is one that has created a buzz all across the country ever since it hit the track and photos have been posted on the Internet. 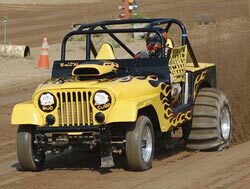 This is the Jeep Altered belonging to Bob Gill. Bob and his son Geoff are no strangers to having some of the nicest race cars at the track and shaking up the record books. Geoff recently set the Top Fuel record with a 2.284 in the Gill Bettencourt Racing Top Fuel dragster and he also holds the C/Pro Jeep record with a 3.210 in the family’s “Black Tie” Jeep. This latest creation from the Gill Family has turned heads since its introduction to the sand. You’ve read about it here on NSDN in several places already. I am referring to the record setting performances at the NSDA Yuma Season Opener. Let’s take a look back at that weekend and the record setters through photos from C3 Productions. C3 always produces some of the highest quality shots in the biz and they live up to their billing with these shots of Geoff Gill and Gary Mink. Photos courtesy C3 Productions – www.c3productions.net or www.myspace.com/c3productionsphotos. NSDA kicked off its 2009 season with the Winter Nationals at the Cocopah Casino & Resort in Yuma, AZ February 13-15. All of the excitement of a new season came to a head with huge numbers being laid down on the fast track surface and close racing in all categories. Let’s recap the racing action from this event. The 2009 sand drag racing season continues on being a record setting season, on and off the race track. On the track, in the month of February, both the Top Fuel and Top Alcohol E.T. class records were lowered at the NSDA Season Opener in Yuma. Geoff Gill ran a 2.284 to take the record for the first time into the 2.2 zone while Gary Mink ran a 2.403 to lower the Top Alcohol record dangerously close to the elusive 2.3 second realm. With the second race of the 2009 NSDA season coming up in March at the same record setting venue in Yuma, there is little doubt that the records will at least be challenged and likely lowered some more.